Like a network reporter announcing “breaking” news, Matthew reports that on the first Easter morning an earthquake rocked the earth, ripped open the tomb, and scared the living daylights out of the Roman guards who “shook with fear and became like dead men” (Matt. 28:4, ceb). This is the second earthquake recorded in Matthew’s Gospel. On the previous Friday, the noonday sky turned black. When Jesus cried out, “My God, my God, why have you forsaken me?” (Matt. 27:46) and took his last breath, “the earth shook, and the rocks were split” (Matt. 27:51). Earthquakes shake our basic assumption that the terra firma will stay firm, that the earth will remain steady beneath our feet, that the world’s current existence is the way it will always be. When the tectonic plates shift beneath the earth’s surface and the ground shakes beneath our feet, it rattles the bedrock assumptions upon which we build our lives. That’s where Matthew leaves the women on Friday night. They feel the earth shake as they watch Jesus die. They see Joseph place his battered, bloody body in the tomb carved into solid rock. They hear the stone roll across the entrance with a heavy, funereal thud. Pilate’s guards place the seal of Rome on it and settle in to make sure that the body stays where it belongs. It is the end of Jesus’ story. Everyone can return to the world and to their lives the way they had always been. The earth itself leaps for joy with the good news that God has not forsaken Jesus. God shatters the all-too-predictable power of death with the unexpected power of new life. The same God who breathed life into dusty chaos on the first morning of creation breathes new life into the lifeless Jesus and brings forth a whole new creation. 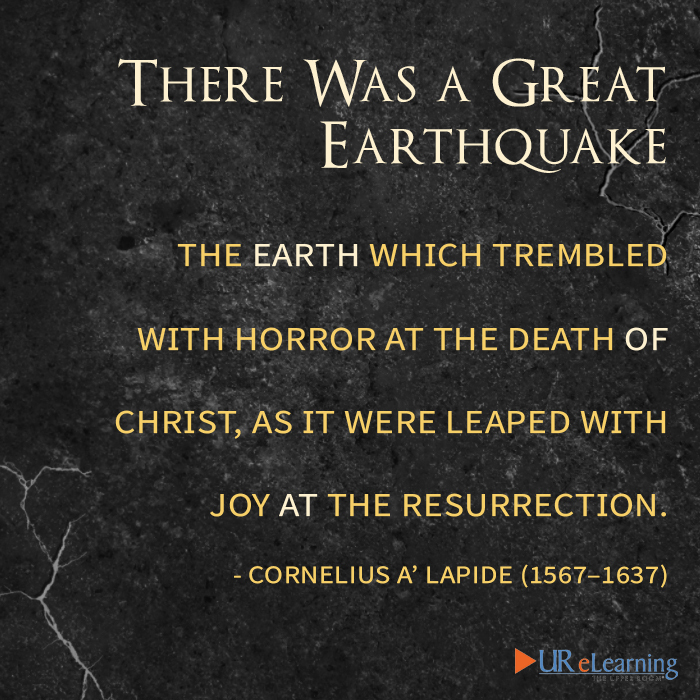 The Easter earthquake invites us into a new creation: a creation not ruled by what Paul calls “the principalities and powers” of this world but by a creation that serves as the living expression of God’s reign revealed in Jesus Christ that is becoming a reality on earth. In this new creation, the tomb does not signal the end of Jesus’ story but the beginning of the reign of his love, grace, justice, and peace. Paul declares the good news, “If anyone is in Christ, there is a new creation: everything old has passed away; see, everything has become new!” (2 Cor. 5:17). The Easter earthquake reverses the deadly, God-forsaken assumptions upon which far too much of our world and far too many of our lives operate. It invites us into a God-soaked world energized by the life-giving presence of the risen Christ. The Easter earthquake shakes our assumptions about our own lives. The earthshaking promise of Easter is that God has not forsaken any of us. The risen Christ will meet us along the confused, chaotic, fearful paths of our lives and speak the same words the women hear at the tomb, “Do not be afraid.” Too often we build our lives on the bedrock of fear: fear of terrorism, fear for the economy, fear of people who are different from us, fear of anything politicians tell us to fear in order to maintain power, fear of rejection, fear of sickness, fear of death. But the Resurrection shatters the power of fear. Because Christ is risen we no longer allow fear to dominate, control, or manipulate us. We don’t remain imprisoned in the tombs of our past failures or buried under the weight of present anxiety. In the risen Christ old things pass away and everything becomes new. The Easter earthquake shakes our assumptions about the world around us. The stone-moving angel says, “[Jesus] is going ahead of you to Galilee; there you will see him” (Matt. 28:7). Galilee—their old world, the place they left behind when they first followed Jesus. Who wants to go back there? But Christ is already on the way to Galilee, and there they will see him. The Resurrection unhinges the assumption that this world is something we leave behind. Instead, Easter promises that what God does in the resurrection of Jesus is God’s intention for the entire creation. The Resurrection contradicts the assumption that Christ resides on an ethereal cloud in a distant heaven. Rather, we find him on the dusty road that leads to the real stuff of our ordinary world. If our eyes are open to see him, we can find him everywhere! The Easter earthquake shakes our assumptions about death.